Hyderabad: Hyderabad Metro Rail Limited (HMRL) Managing Director N.V.S. Reddy told reporters on Tuesday that eight km long stretch between Nagole and Mettuguda and 12 km between Miyapur and SR Nagar may commence commercial operations either on ‘Ugadi’ or June 2, Telangana state formation day. He said the two stretches in two different corridors were ready for operations. Asked about the delay in launching the commercial operations, he said opening two small stretches in two different corridors was not considered advisable. The official said 70 percent of the 72 km elevated project had completed. He said they were trying to sort out certain issues related to land with the railways. Construction major Larsen & Toubro, which is developing the metro project, had last month stated that it remained committed to the project and was making all efforts to complete it expeditiously. The developer clarified that it is sticking to its deadline of making the project fully operational by December 2018. As per the concession agreement signed with the then government of united Andhra Pradesh in 2010, the project should have been completed by July 2017. The concession agreement for Rs 14,132 crore project, said to be the largest metro project in the world in public-private partnership, was signed in September 2010 but the work commenced in July 2012. 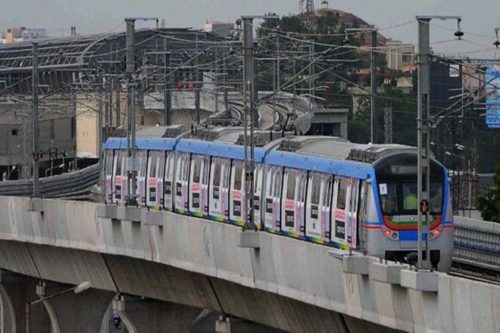 L&T Metro Rail (Hyderabad) Limited in 2011 had achieved financial closure for Rs 16,375 crore – Rs 14,132 crore for the metro rail system and Rs 2,243 crore for the first phase of real estate development. Admitting in May this year that there has been cost escalation, the company did not share the figures, saying they are “dynamic”. Impressive performance of DMRC in completing projects b4 time n perform trial runs. HMRC slow work shows non seriousness. My sincere best wishes 2 dr.Maghu Singh 4 his efforts 2 bring delhi metro one of the bestate organisation. I really appreciate his professionalism. Keep going n best wishes.